Annan bounced back from the previous weeks late dissapointment of losing an injury time goal when they collected all the points with an important victory at Gayfield park over the in form Arbroath who’s three match winning run came to an abrupt end. Annan’s victory was secured in the first half courtesy of a superb 10th minute strike by Peter Weatherson and an own goal scored by the unfortunate Rickie Little from a Rabine Omar corner in the 20th minute. The two first half goals were enough to see Annan through a second half where they were content on sitting back and defending their two goal advantage. The Annan line up showed one change from the previous week with Weatherson making a return for the unavailable Sloan. It was a fine day for football with the match played in glorious sunshine and no wind for the players to contend with. After only four minutes the home team were presented with an opportunity after Gillfillan’s testing challenge on Keiran Stewart right on the edge of the box resulted in a penalty. The referee was well placed to award the spot kick, despite Gillfillan appearing to connect with the ball. Bobby Lynn stepped up to take the penalty and he was denied by Jordan Hart who pulled off a good save to his left hand side to deny the home team an early lead. The save proved to be a defining moment in the match as six minutes later Annan got their noses in front. Annan pushed forward and were awarded a free kick wide on the right which was defended by Arbroath for a corner, Rabin Omar’s dangerous corner was cleared to the edge of the box where Peter Weatherson struck a corker of a shot into the top corner of the net past a host of players and keeper Allan Fleming. It was a superb strike by Annan’s top striker. 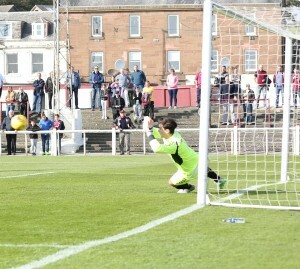 Annan built on this breakthrough forcing a couple of corners which were well defended by the Arbroath defence. At the other end Hart cut out a low cross fired in from the right. A poor header by Watson presented Andy Ryan with an opportunity but the finish did not seriously test Hart an the potential opportunity was lost. Annan doubled their lead in the 21st minute. Osadolor’s well struck shot was well saved by Flemming turning the ball past for a corner. Rabin Omar’s dangerous corner once again created concern at the heart of the Arbroath defence and the Rickie Little under pressure deflected the ball into the net from 5 yards. Annan’s threat up front was more than evident and in the 38th minute Osadolor should have done better from Flynn’s inviting cross with his header going wide of the target. Arbroath’s best chance of the half in the 40th minute was the result of a penetrating run from Bobby Linn when he threaded the ball into the path of Andy Ryan but the chance was lost by solid defending by Annan. The home side pushed hard leading up to half time but they were continually thwarted by the well organised disciplined Annan defence who restricted the home teams threat. The second half saw Arbroath dominating possession and pushing for the breakthrough against an Annan team who appeared to be quite content to defend their two goal advantage. 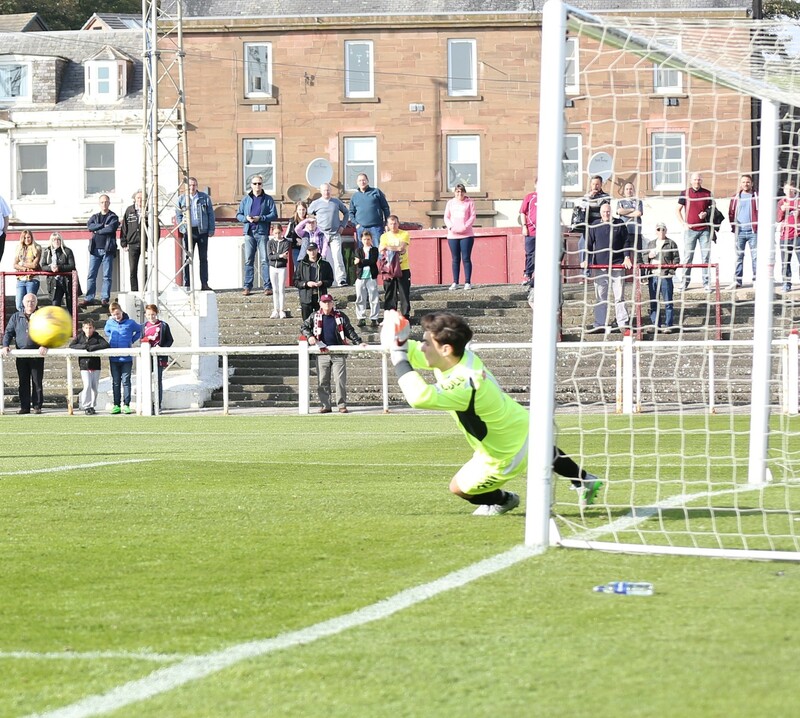 The frustrated Arbroath team were caught offside on numerous occasions. Arbroath did manage a breakthrough in the 65th minute when substitute Grehan headed home but the goal was chalked offside. Ryan Finnie was introduced for his Annan debut at the expense of Osadolor in the 67th minute as Annan boss Jim Chapman packed his midfield, minutes later Weatherson was presented with a rare opportunity as Annan won a free kick 25 yards out but the effort failed to test the home keeper. Arbroath’s territorial advantage was not matched by their goal scoring opportunities and Annan saw the game out to send them back to the top of the League 2 for the third time after Queens Park , East Fife and Elgin City all failed to win but victories by Montrose and Berwick Rangers have made the league incredibly tight with three points now separating seven teams after a quarter of the fixtures are completed. ARBROATH :Allan Fleming, Andy Munro, Craig Johnstone (Joao Victoria 80 min), Ricky Little, Andy Munro, Mark Whatley, Bobby Linn, Keiran Stewart ( David Gold 60 min), Andy Ryan ( Martin Grehan 49th min), Sergio Alvarez, Darren Ramsay. Subs not used Jordan Lowdan, Jamie Clarke, Callum Broadie. ANNAN ATHLETIC : Jordan Hart, Steven Black, Steven Swinglehurst, Martin McNiff, Peter Watson, Bryan Gillfillan, Rabin Omar (Jamie Watson 89 min), Mathew Flynn, Peter Weatherson ( David Ferguson 84 min), Josh Todd, Smart Osadolor (Ryan Finnie 67 min). Subs not used Blair Currie, Ryan McStay, Greig Macdonald, Liam Park.